Beautiful! (Kids, decor, everything!) Okay, can you share your secret? 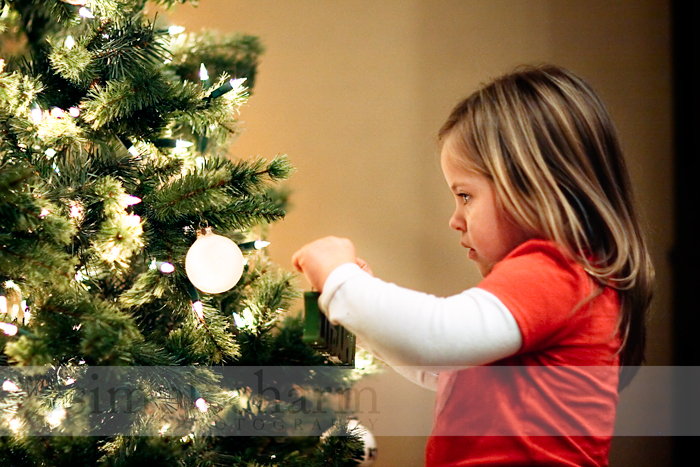 I have always struggled at Christmas time to capture the glow of the lights, the sparkle in the kids' eyes when decorating (the reflection from the lights in their eyes) and you did it... can you give me some hints on your settings? Taken during the day? Night? Fill flash? No flash? ISO? I can't seem to get the right combination! Thanks for sharing! These pictures were taken at night with no flash. I do not have a fill flash and I never use my on camera flash -- I hate it. Ha. The shots of the kids putting the ornaments on the tree ---> shot at f/1.2, ISO 400 (which makes them a bit noisy on my camera ... grr) and I was shooting on TV, which is shutter speed priority. Since it was dark, I knew I needed to keep my shutter speed up so my pictures were not blurry ... and I didn't want to increase my ISO because of noise. So I went with shutter speed priority at 1/125 ... although Mason's picture was shot at 1/80 -- not sure what the deal was there. So with those settings, I kept my focal point on their eyes (of course) and tweaked a bit in Photoshop CS4. And even so, they still are not tack sharp ... but for the purposes of my blog, I didn't care. Ha. The mantle and ornament shots were taken on AV using a higher ISO and then I used noiseware to try to remove some of the noise from the pictures. My shutter speed was lower and my aperture was upwards of 2.0 - 4.0 since I wanted them a little more in focus. 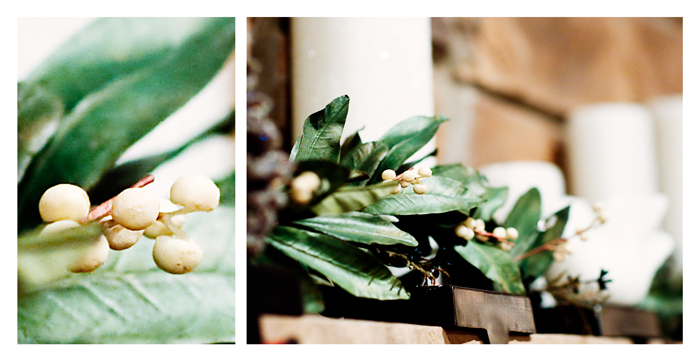 Shooting that close at 1.2 gave me a lot of bokeh ... which is beautiful, but not what I was looking for here. What lovely pictures. I'm very impressed and inspired. Okay, I have to know - what camera and lens do you use? Such beautiful clarity in your pictures. Thank you! I shoot with a Canon Rebel xTi ---> however I desperately want to upgrade. 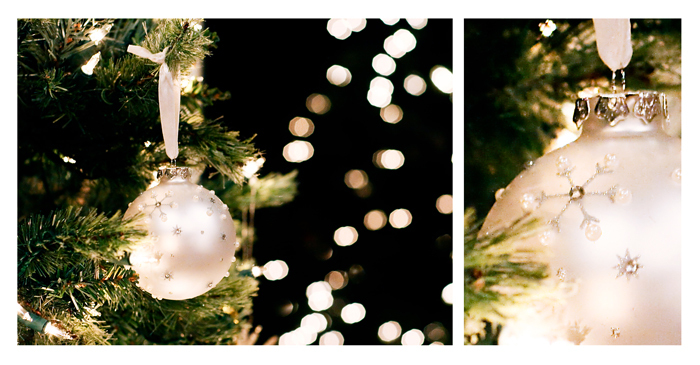 The Christmas pictures were taken using an 85mm 1.2 lens ... which is a magical dream lens that I am renting. And of course, the pictures were all tweaked in Photoshop CS4. I have received a lot of questions about photography that I'm positive I have not answered, so here is your chance ---> ask away! You know I have a million questions. What is noiseware? What photo editing software do you recommend? We bought photoshop but I can't even figure out how to use it. And is there an online tutorial you can recommend? Glad I'm not the only one with a noisy camera at iso 400. It's ridiculous. Can you give any advice for beginners or what a be beginners? i have no photo ability.. i point and shoot! haa! i think they look great! I love your pictures - you are an amazing photographer! My question is how did you learn how to use Photoshop and was it difficult to learn? my camera is noisy above ISO 400 too. I took a class a few months ago and still need TONS of practice, but at least I know what you are talking about here, that says something. Lol. I always shoot on AV Mode though. I should try TV. Can you recommend a high quality camera for a beginner (just in case Santa's reading over my shoulder)? I love my $200 point & shoot, but it just can't take a picture in low light. Something $500 or less... is that too cheap? Thanks for answering! You must have WAY more light in your living room than mine! At similar settings, my ISO would have to be WAY higher than 400 to even SEE what's in the picture! Just goes to show that one can ask tons of questions of others, but it just takes LOTS of practice and trial & error to really learn what works for you! Thanks so much for sharing your knowledge... and I'll just keep practicing! Didn't you use to use a SLR camera or something? ?